Cloud spending may, it turns out, be seasonal. Spend last month dropped to £12m, the lowest seen since October 2013 - all the more noticeable after the bollard budget blockbuster that was March spending. Start of the new financial year and everyone is, it seems, planning rather than doing. Lot 4 continues to dominate with 79% of the spend (Lots 1 to 3 are 6%, 1% and 13% respectively). Much of the rest - top spending customers, top earnings suppliers etc - stays the same. But there are some anomalies. Last month I reported that the lowest spending customer had spent only £63.50. This month they've moved higher with £85.90. Thirteen customers have, though, still spent less than £1,000. 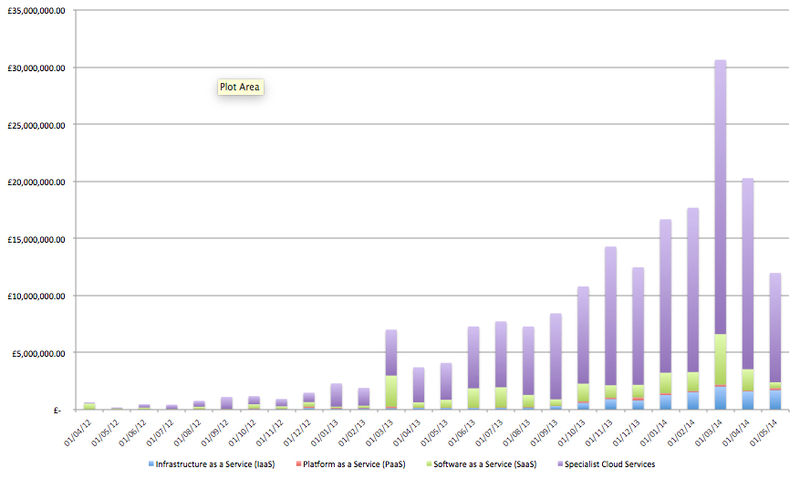 We do, though, have nearly 500 customers (489) which is, in my view, more important than the growth in spend - it shows either (a) that more people are looking at what the cloud can do for them, which would be good all round or (b) that more people have found that G-Cloud as a framework, GCaaS, can help them which is still good because it's transparent and we can see whether they spend more in the coming months. 51 suppliers have seen revenues of more than £1m. Some of those are brand name, paid up, members of the Oligopoly. Others look new to the public sector and certainly new to having access to quite so many customers. There are some other anomalies too - I assume the result of data capture errors. One supplier has a revenue line showing £1,599,849.80 which is listed as "blank" - there are 9 other such lines, though the other numbers are far, far smaller. It would be nice to know where to allocate that money. It may be that it is correctly allocated by Lot (so shows up in the graph below where there are no "blank" entries) but not correctly tagged with a product description. Still be nice to know. - The Crown Commercial Service are a bigger user of Skyscape than any other purchaser (£1.4m - double HMRC spend, neary triple Cabinet Office spend, nearly 5 times Home Office). Is that all hosting of the G-Cloud store and other framework services? Still, there is no other framework in government that gives access to such a wide variety of suppliers (many new to the public sector) and no framework that publishes its information at such a transparent level. For those two reasons alone, G-Cloud still deserves applause - and, as it grows month on month, I hope that it will only get louder.